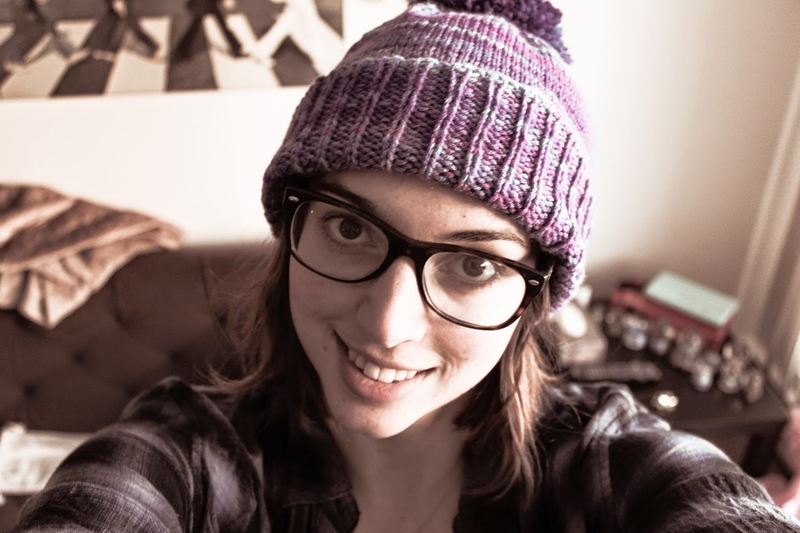 I've been knitting up a tonne of hats this winter. 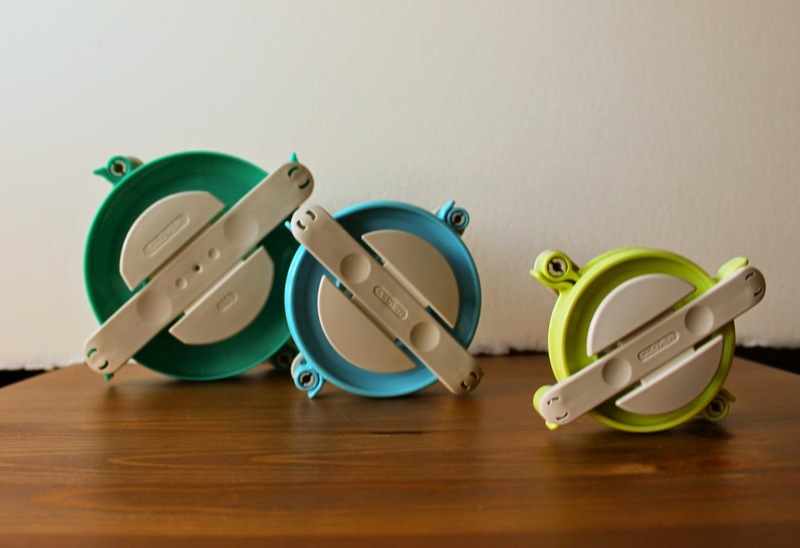 They just make the perfect gifts. Plus they're extra cozy, and give me a chance to whip up a pom pom on my new fancy pom pom makers. 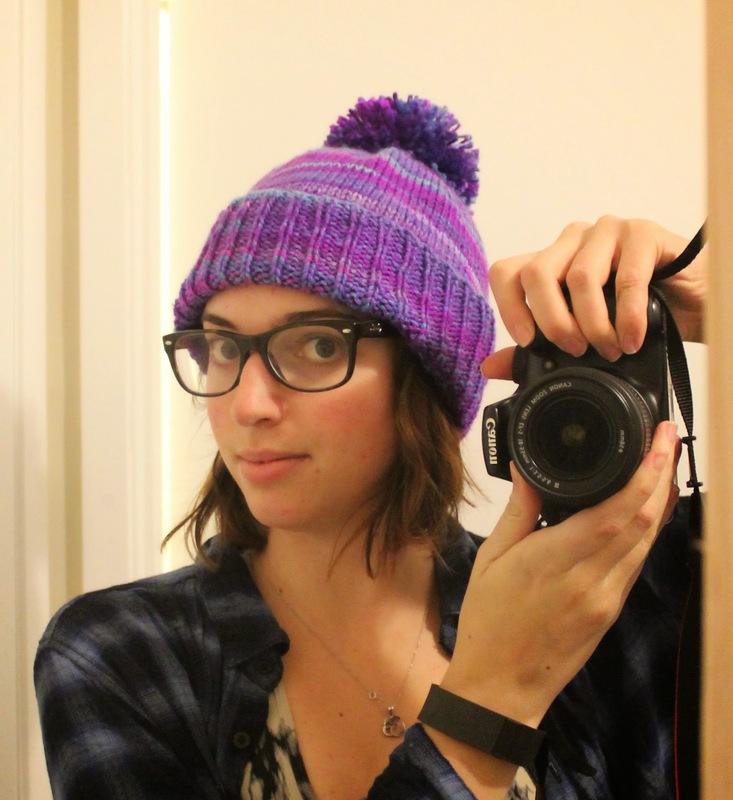 One pattern that I happen to love for knitting toques is the Purl Bee's Classic Cuffed Hat. I've adapted this one several times this year to make NHL team hats for my cousins. 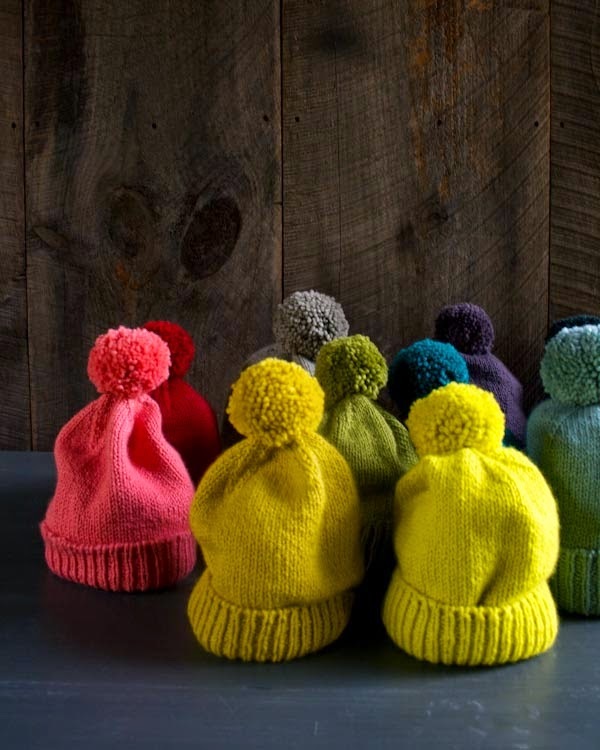 The original solid coloured hats by the Purl Bee. 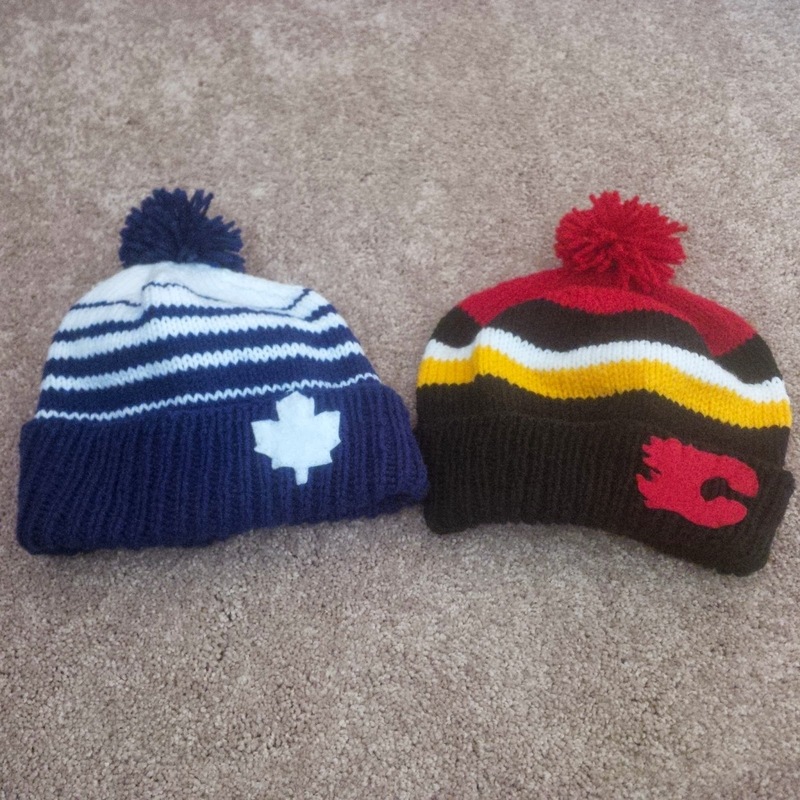 My Toronto Maple Leafs and Calgary Flames versions (knit in Red Heart Super Saver). 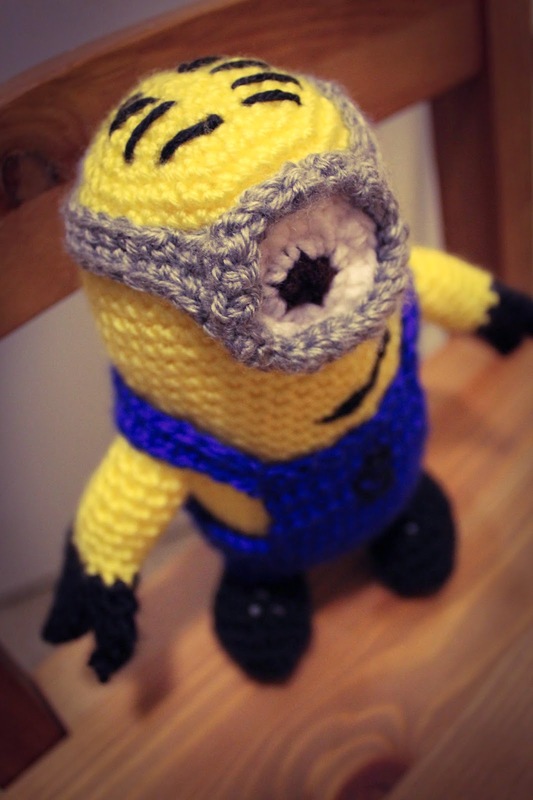 But since I have been wanting to experiment more with creating my own patterns, knitting on the fly if you will. I worked up this purple hat for my cousin Julia, in Red Heart Super Saver variegated purple yarn. The hat has a knit one/purl 2 ribbed cuff, and spiral decreasing through the crown to give it a less square shape than then Classic hat above. The variegated yarn gives it a fun coloration, and the larger pom pom suits the hat better I think. 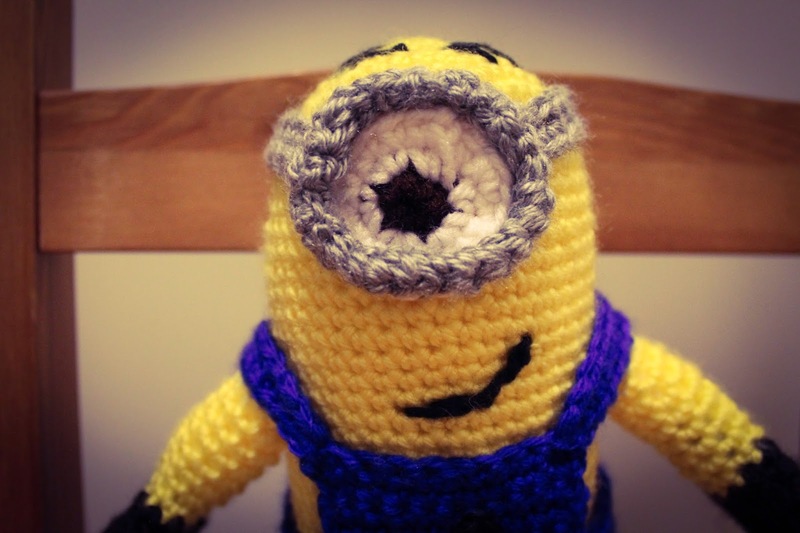 I'm knitting up a second one for myself right now, and writing out the pattern as I go, so I'll be sharing the pattern here in a week or so. 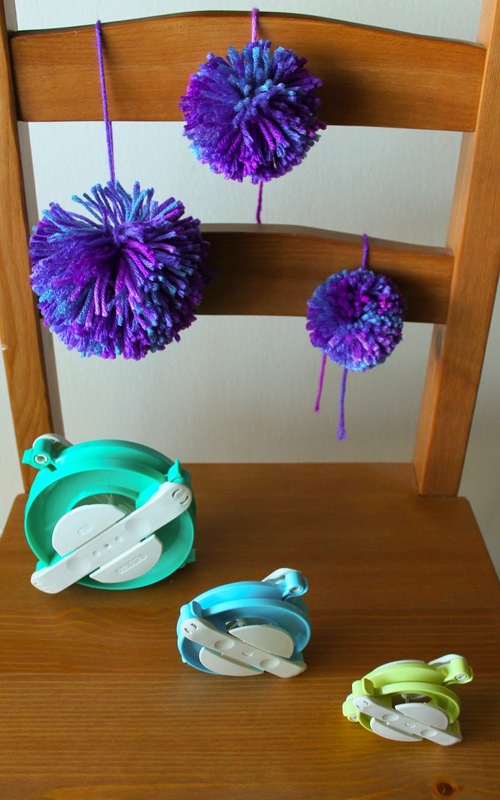 Over the holidays I finally traded up my cardboard circles for real pom pom makers. And I can tell you, I'll never go back! 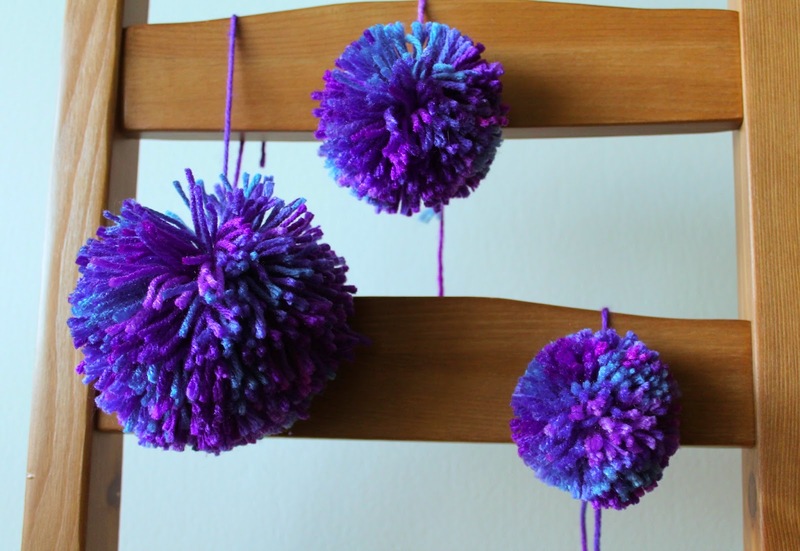 Here are a set of three poms made from Red Heart Super Saver Grape Fizz. I made up all three sizes to see which I preferred for a hat I was working on. 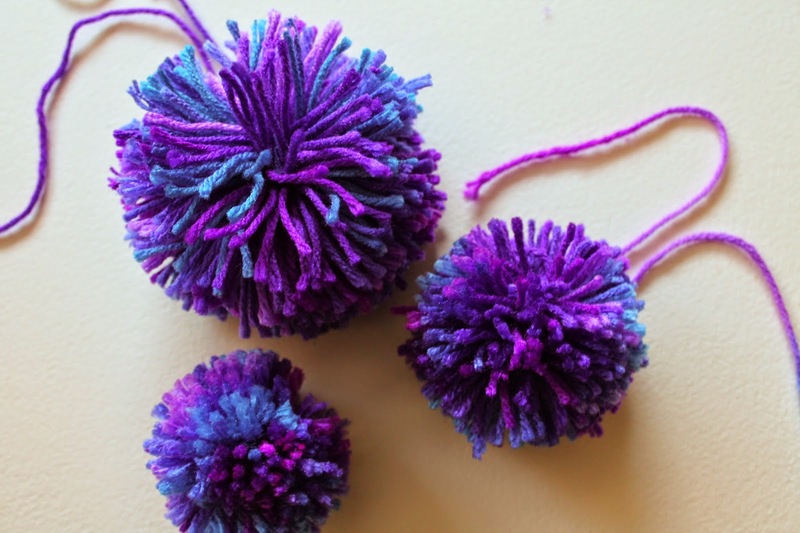 The pompom makers are made by Clover and purchased at Mary Maxim, and run about $11 for the jumbo one and $9 for the blue and green pair. 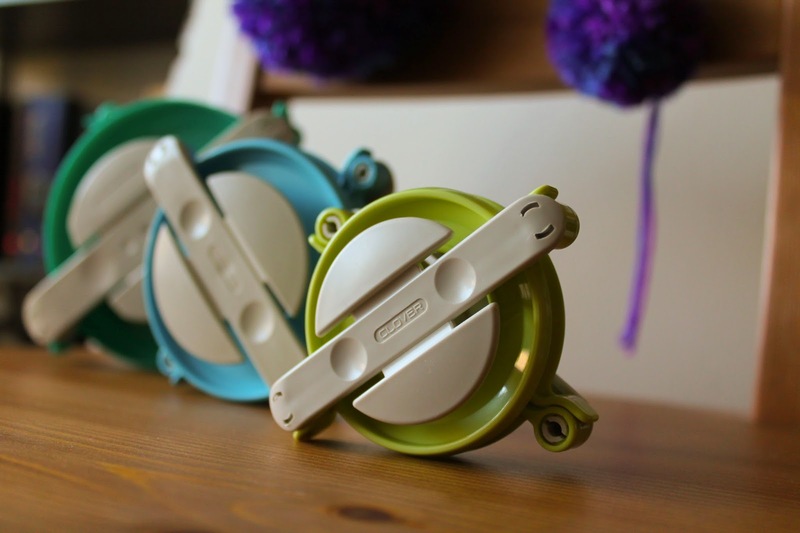 The jumbo makes a 4.5'' pom, the blue makes a 3.3/8" pom and the yellow green a 2.5" pom. You can wrap more or less yarn to make them more or less dense, or wrap combos of colours to make half and half or patterned poms. Here's a short YouTube video tutorial on using this particular set of makers. There's a couple of styles of makers out there, so if I try any of the others I'll let you know how they worked out. 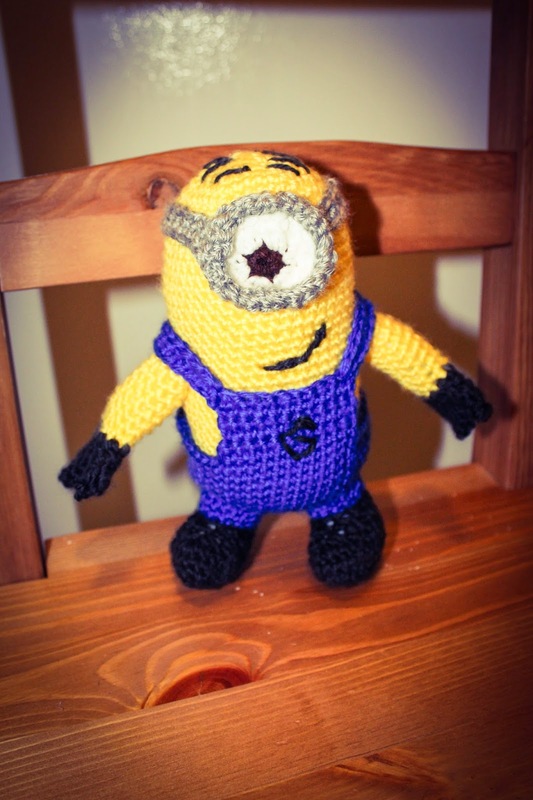 What a better way to start off 2015 than with a project you had hoped to start and finish before Christmas? 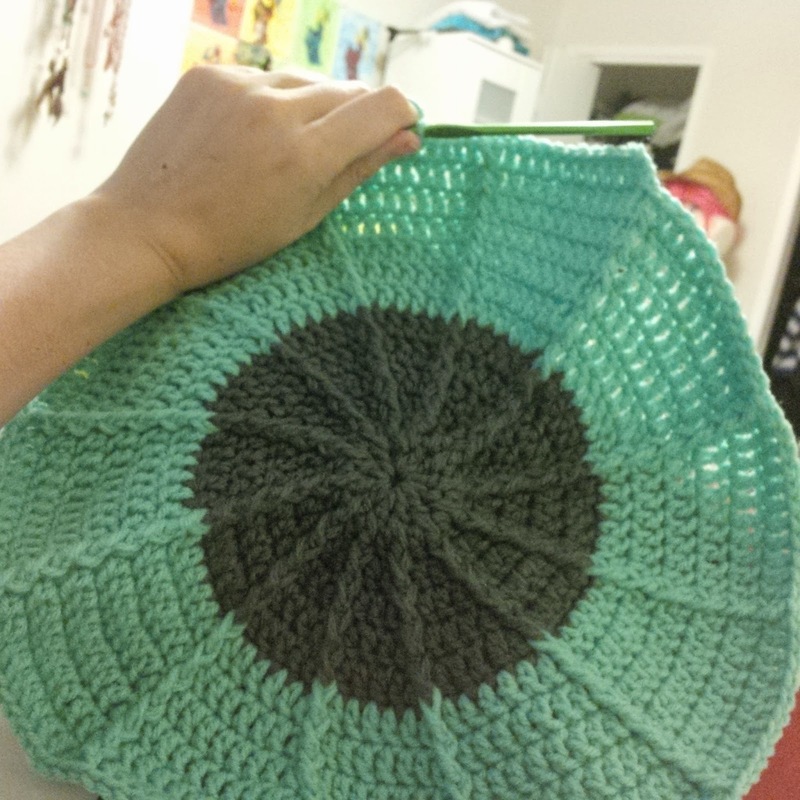 In keeping with a long Turner family tradition of using acrylic, super saver yarn, I picked this pattern from the Red Heart website. ﻿You can probably guess that this blanket is headed for my niece Penelope, I love the owl, and apart from the blue (I went with more of a teal) and whit, the rest of the yarn will be stash busting for me. The first rounds worked up fast, but now things are beginning to take a lot more time. I'll keep you posted on the progress, hopefully I'll have it completed before I see her next in March.